The Portland West PGA Junior League Golf team won the Sectional qualifier at Rock Creek CC on July 27, defeating the Bend, Tacoma and Portland East teams. The Portland West team is made up of juniors from Rock Creek CC, Tualatin CC and Meriweather National GC, with Coach Bobby Fernandez (Asst. Professional at Rock Creek CC) and soon-to-be Assistant Coach Chris Gonzalez (Asst. Professional at Tualatin CC). 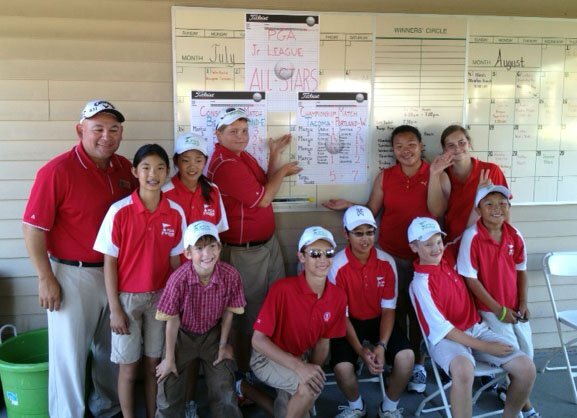 The Portland West PGA Junior League Golf team members are Jonathon Lu, Connor Cole, Ethan Tseng, Jennifer Kang and Alexa Udom from Rock Creek CC; Melia Nordberg and Dalton Burk from Meriwether National GC; and Tabetha Kang, Christian Vece and Ian Chaff from Tualatin CC. We wish them all the best of luck as they travel to Sacramento to compete in the Western Regional Championship, August 17-18. At the Western Regional Championship, a round-robin competition, the Portland West team will face three teams for the title of Western Regional Champions. The other teams come from the Sectional qualifiers in the Northern California and Southern California PGA Sections. It is one of three Regional Championships being conducted across the United States. Six teams will qualify from the Regional Championships to compete in the PGA Junior League Championship, September 6-8 in Atlanta, Georgia. PGA Junior League Golf is a brand new PGA program, designed for boys and girls, ages 13 and under. PGA JLG features team vs. team competitions in structured leagues that provide a popular, less stressful scramble format as opposed to stroke-play competition. It has been fully embraced in the Pacific Northwest Section. Click here to find a PGA JLG team near you! If you are a PGA Professional interested in forming a PGA Junior League Golf team at your facility, click here for more information and to register.